Nearly 2.5 million new cars were registered in 2014 – a 10-year high and 9.3% ahead of 2013. This trend has continued in 2015, data released by The Society of Motor Manufacturers and Traders (SMMT) show that in March this year the new car market grew for a 37th consecutive month. Figure 1 shows the pattern of registrations over time overlaid with the SMMT projections that estimate 2015 to be another very good year for the industry. This may be an underestimate. For the general public fuel cost is uppermost in their mind when running a car. As fuel costs reduce, the cost of ownership falls, stimulating sales. The significantly lower cost of fuel is setting 2015 up as another very good year for car sales. This is further supported by supply side factors. Until the civil war erupted in the Ukraine, vehicle production plans incorporated substantial growth in the Russian market in particular. Since then the impact of sanctions and resulting fall in the value of the rouble have left a large number of eastern-bound vehicles looking for a domestic buyer. The property industry too had a good year in 2014 with double digit returns and a thriving occupational market. The optimism created has continued into the first half of 2015. From the perspective of automotive property, 2014 was also a record year with some £460 million of dealerships transacted during the year – 70% by dealers, 30% by manufacturers. A snapshot of the market in May 2015 sees a prime yield of 4.75% with an average yield of 6.5%. The average size of transaction is around 20,000 square feet with a capital value of £170 per square foot. The average rent seen so far in 2015 is around £12.00 per square foot, which is well below the general level of market rents for modern dealerships. Investors were active over the past year. Fund ownership of automotive dealerships in 2015 is estimated at around £1.4 billion. WP Carey, following their purchase of the Pendragon portfolio, hold over £230 million of dealerships. Other owners include Schroders, Aviva, Aberdeen Asset Management, LaSalle, Hermes, L&G, Threadneedle, F&C REIT and Royal London. Prime yields have been falling since 2011 reaching 4.35% in 2014. 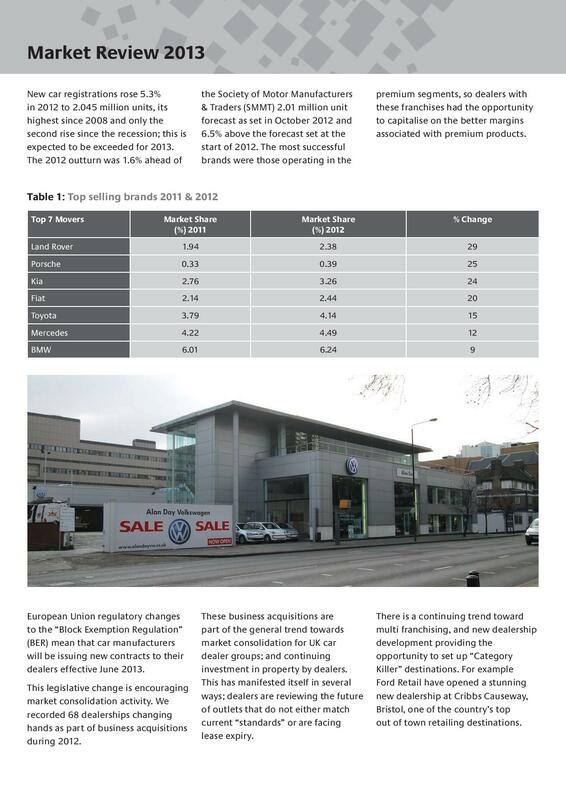 This figure sits very well against comparable retail property between the High Street and Foodstores. lease term; presenting significant opportunities for improvement. Regionally there is a spread of prime yields emanating from 4.35% in Greater London. As would be expected, values are the highest in Greater London and the South East where sites are short and competition is at its most fierce. However, prime yields in the North West (Manchester) have moved below 5% in an active market. This demonstrates the opportunity for yield compression in regions like the East and West Midlands and Yorkshire where current primes sit 100 to 150 basis points above this level. Looking at property market activity by marque over the year to May 2015 Ford dealerships saw almost a quarter of the transactions followed by Vauxhall with 15%. Combined, the Volkswagen branded dealerships – VW, Audi, Seat and Skoda – also took some 15% of the market. BMW and Jaguar Land Rover dealerships both saw around 9% of transactions – the latter boosted by their plans to integrate Jaguar and Land Rover brands into a new combined network. These numbers however have been influenced by the WP Carey deal which transacted at the end of 2014. If this deal is ignored from the above analysis then the Volkswagen branded dealerships total around 22% of all transactions, Honda makes up around 12% and Mercedes Benz and Citroen both have 8%. Average rents in the past year see a wide range by region. At the bottom of the table sit Scotland and Wales between £7 and £8 per square foot. Yorkshire and the Humber is not much above this level at £8.50. Then there is a jump to between £12 and £13 per square foot that encompasses the North East, North West, East of England and the Midlands. Finally there is a gradient rising from the South West (£16.50) through the South East (£17.80) to Greater London at £19.00. 2015 is delivering an active market. It is anticipated that these heightened levels of activity, coupled with a limited supply of property, will feed through into higher rents as new developments come on stream. It is anticipated that the pre-let market will signpost significant rental growth. As dealers turnover and profitability increases, bolstered by enhanced new and used car sales, the number of vehicles on the road (the vehicle parc) increases. This correlates with an increase in servicing business which can account for some 65% of dealer profits. Property is one of the biggest costs for dealers, after stock. Over the past year the pendulum has swung in favour of property owners with dealerships and dealership development sites being sought after and commanding premium prices. Unsurprisingly, rents are beginning to rise, evidenced in particular by new dealership developments. Prices are also being pushed higher by rising build costs. 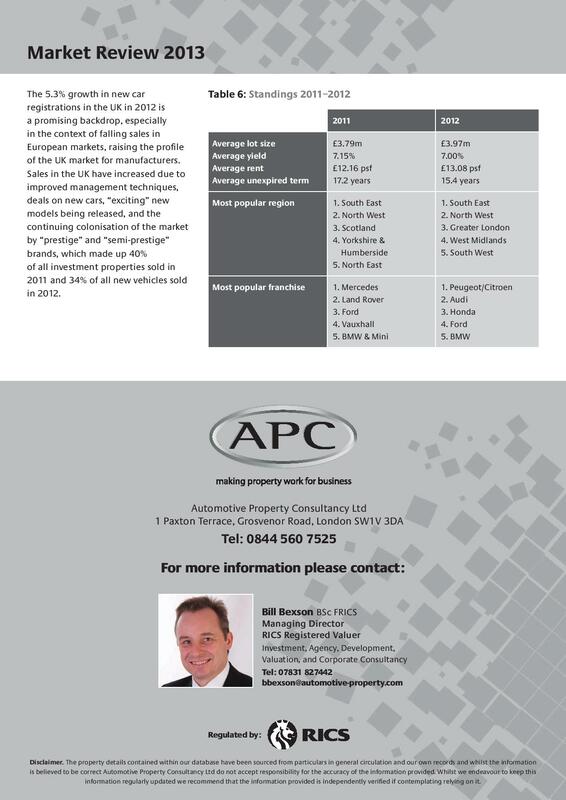 2015 will continue to offer significant opportunities for investment based both on rising income and rising values. The investment climate in the first half of 2014 continues to be healthy. The average prime yield is reported to have fallen by 17 basis points over the quarter to stand at 5.7% at the end of the second quarter. Capital values at the ‘All Property’ level increased by 3.8% over the quarter, with 6.8% capital value growth over the year to date. The closest competitor class for automotive dealerships is Retail Warehouses. Yields here fell sharply in the second quarter- by an average of 25 bps so far this year. Research shows retail parks at 4.75% net initial yield with standalone sites in a range between 5.5% and 7%. 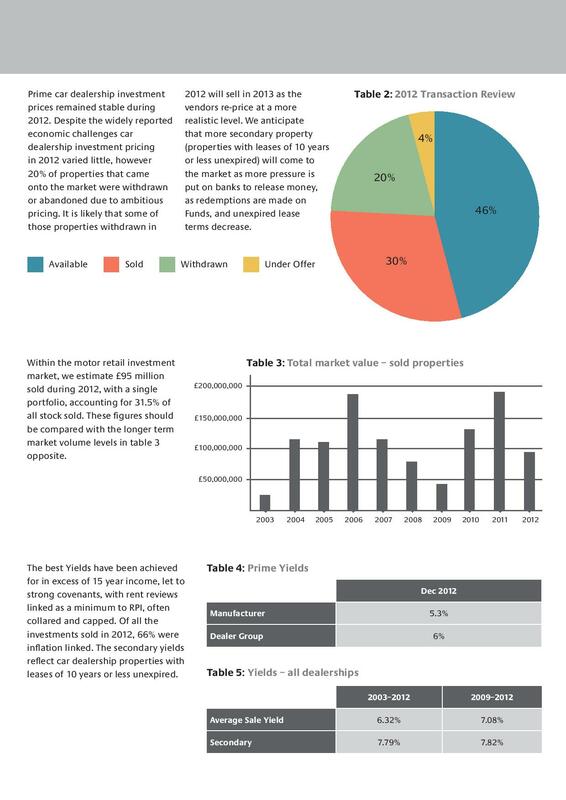 By comparison the automotive sector has seen dealerships change hands so far in 2014 at an average yield of 6.36%. The research also reports good levels of liquidity in the market and an expectation that yields will continue to move in over the course of the year. Investment in auto dealerships over the last decade totals over £1.4 billion spread across the UK. Figure 1 shows that London and the South of England has been the most active market with some 43% of the value traded compared with 29% for the North and Scotland and 28% in the Midlands and Wales. £125 million over the last decade in a range between £57 million (2009) and £212 million (2013). 2014 has seen over £135 million in transactions so far and is on target to reach £180 million by the end of the year. As might be expected Greater London shows the lowest initial yields over the past decade coming in 60 basis points below the average yield. Lowest prices have been seen in Wales where the ten year average yield was 139 basis points above the average. Overall Figure 3 shows the South and the Midlands have seen below average yields while the North and Scotland were above average. Investment activity in 2014, broken down by franchise, shows the premier brands dominating the market with 72% of the transactions by value. This represents close to £84 million spend out of the £135 million transacted in 2014 so far. Figure 4 shows the breakdown by franchise. In the last five years the investment market has been dominated by fund management purchases. This is demonstrable in Figure 5 where fund purchases have moved from 40% of the total value in 2009 to 79% in 2013. So far in 2014 over 90% of purchases by value have been made by Fund Managers. The counterpoint to this is a fall in investment from occupiers – dealer groups and manufacturers – from 22% in 2009 to just under 15% in 2013. Occupiers have made just under 5% of purchases so far in 2014. Currently, the yield profile of automotive dealerships gives scope for compression when compared with many retail warehouse investments. This has not gone unnoticed by fund managers who have spent over £500 million on this product over the past five years. All the while demand for cars remains strong – and the prospects look good for the next few years – automotive dealerships are likely to remain attractive investments. Schroder Property is today pleased to announce the acquisition of three separate transactions of modern car dealerships in Yorkshire, Lancashire and Nottingham for the total amount of £8.03 million. All the properties are let to Pendragon Property Holdings Limited. The properties have been acquired through the Motor Retail Investment Limited Partnership, established in July 2011. The Partnership is a joint venture between Schroder Property Fund and Schroders Multi Manager clients. Purchased for £1.375 million with a net initial yield of 7.22%. The property is leased for a term of 30 years from the 2nd November 2001 (17 years unexpired) with 5 yearly upward only rent reviews to market rent. The passing rent is £105,000 per annum (£10.91 psf). Purchased for £3.755 million with a net initial yield of 6.86%. The property is leased for a term of 25 years from 30th December 1998 (10 years unexpired) with 5 yearly upward only rent reviews to market rent. The passing rent is £272,515 per annum (£12.55 psf). Purchased for £2.9 million with a net initial yield of 7%. The property is let to for a term of 20 years from 21st December 2004 (10 years unexpired) on full repairing and insuring basis. The rent is reviewed upward only every 5 years to open market value. The passing rent is £214,967 per annum (£13.88 psf). The vendors were represented by Mathias Perry (Vauxhall, Beverley), Whitmarsh Holt Young (Ford, Ashton Under Lyne) and Torrin Asset Management (Land Rover, Nottingham). The purchasers were advised by Automotive Property Consultancy Ltd.
Schroders has managed property funds since 1971 and currently has £10.6 (€12.8 /US$17.6) billion of gross property assets under management as at 31 December 2013. Schroders is a global asset management company with £262.9 billion (EUR316.0 billion/$435.4 billion) under management as at 31 December 2013. Our clients are major financial institutions including pension funds, banks and insurance companies, local and public authorities, governments, charities, high net worth individuals and retail investors. Further information about Schroders can be found at http://www.schroders.com. Issued by Schroder Property Investment Management Limited which is authorised and regulated by the Financial Conduct Authority. For regular updates by e-mail please register online at http://www.schroders.com for our alerting service. 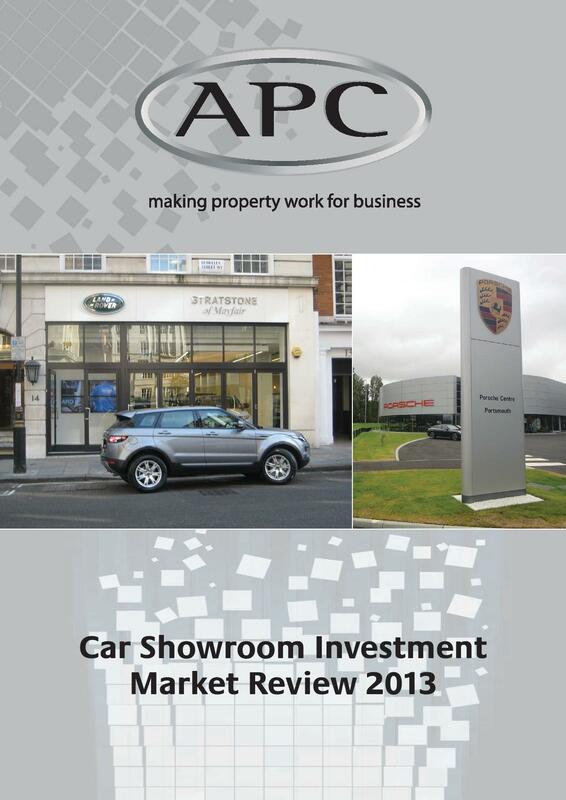 In 2013 APC recorded its highest level of Investment transaction in the Motor Retail market in 10 years! LaSalle Investment Management have acquired a portfolio of five Volkswagen-let dealerships from DVS Property Ltd. The portfolio comprises five modern dealerships, three of which are Audi outlets in Chester, Hereford and Stoke, one Volkswagen dealership in Hereford and a Skoda franchise in Cramlington. All the properties are let to the VW Group for 20 years with five yearly RPI linked uplifts to RPI at a minimum of 2.4% per annum and capped at 3.0% per annum. The purchase reflected a net initial yield of circa 5.3%. DVS Property Ltd were represented by Strutt & Parker and the purchasers were advised by the Automotive Property Consultancy and Wilkinson Williams. Car Dealership investment in 2013 has already outperformed the whole of 2012!